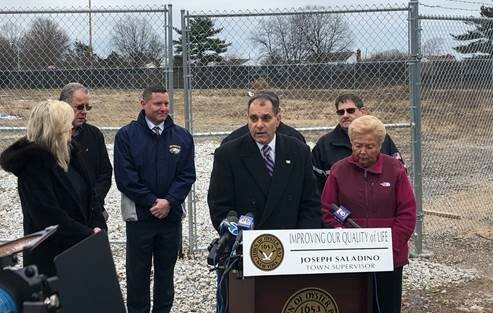 Oyster Bay Town Supervisor Joseph Saladino today announced a major environmental cleanup initiative at a contaminated ballfield at Bethpage Community Park. The ballfield, closed to the public since 2002, will be cleaned to residential standards through a project performed by Northrup Grumman with State Department of Environmental Conservation (DEC) oversight. Through the Town’s efforts, and with cooperation from the DEC, the Northrup Grumman Corporation is taking action to remediate two types of contamination under the ballfield. The project will be performed in two parts, to address the two different types of contamination. Phase I of the project will address Volatile Organic Compounds (VOCs), with installation of remediation wells. Contractors will be installing wells, which will be utilized for treatment under Phase II of the plan. Under Phase II, which is anticipated to begin in the spring, these wells will be utilized to install the remedial systems necessary for VOC removal. While the wells and necessary piping will be installed in the ballfield, the actual remediation system will be located on the adjacent Grumman-owned property. As the equipment begins to do its job, the second part of the project will involve excavation and safe disposal of contaminated soil off Long Island. “Throughout the entirety of this project, precautions are being put in place to guarantee the safeguards our residents and this community deserve,” Supervisor Saladino added. Elevated levels of soil contamination in parts of Bethpage Community Park were first discovered in 2002, closing the park to close to the public. Sections reopened following extensive testing, and in 2006 the park underwent a significant remediation project. The ballfield, however, remained closed as contamination levels reached far below ground and the cleanup required for full remediation was exorbitant.